Works in Progress--Before and After! 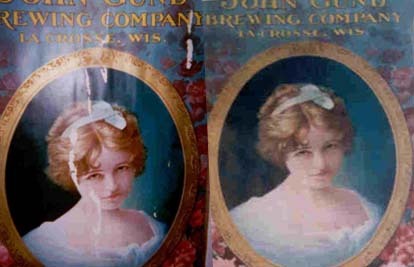 This is a delightful poster advertising the John Gund Brewery Co. It had extensive water damage due to a burst pipe where it was stored. Had total loss of paper in some sections of poster. It was removed from its old board, cleaned and de-acidified, and re-laid onto Japanese tissue paper. Lost surfaces were made good and delicate touch�ups restored the lost portions to its pristine finish. This was badly eaten by insects, stained with acid from old boards. Cleaned and de-acidified. It was decided to leave the ragged edging on the piece as they were part of its �history�. Badly water-stained at the bottom, showing signs of foxing. Foxing are the little brown stains that appear on paper items. 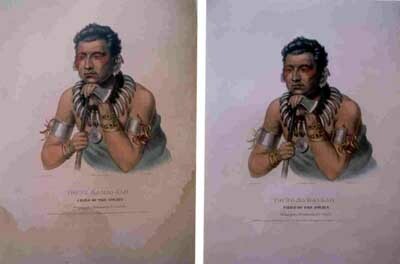 This is caused by mildew that has died and left its residue behind.The original handcolored print was carefully washed and cleaned with no loss of the old bright coloring. 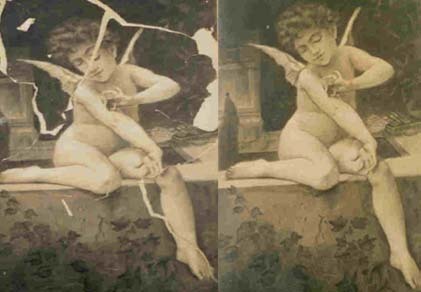 This oil, dating from the 1890�s, showed cracked paint, yellowing varnish, and smoke damage.With the canvas re-lined, the oil was cleaned, and missing parts were touched in. 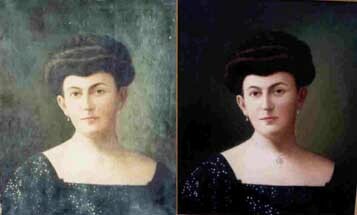 Then, two layers of new varnish not only protect the painting but also enhance the image. 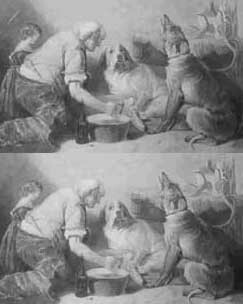 By Thomas Landseer. This framed picture had fallen off the wall, the glass had broken and pierced the print. (see white mark in top picture, top left corner)The cut was repaired and carefully touched up to be made invisible. This watercolor had been stored in a damp basement and had one of the worst cases of mildew I had ever seen. The active mildew was killed by gassing, then it was removed with careful brushing. The mildew had attacked the paper�s surface, totally destroying the image beneath. 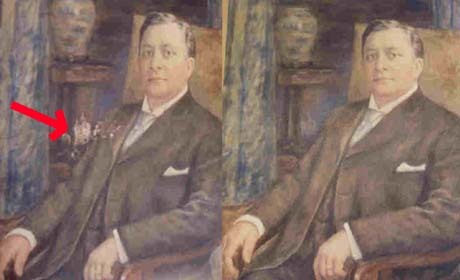 Once the paper was consolidated, the watercolor could be touched up with the same type of watercolors used during that period. This charcoal drawing had been stored in a hot attic, stretched over stretcher strips! The extreme heat in the attic caused the paper to become brittle and to shatter into pieces. Once it was removed from the stretchers, the piece was cleaned, deacidified, and laid onto Japanese tissue paper. Since there were obvious gaps, old paper that matched the material in the original image was found and used to fill in the holes. Then it was touched up, using charcoal to complete the image.